In 1937, just as Walt Disney was finishing up Snow White and the Seven Dwarfs, a merry-go-round opened in Griffith Park along the route Walt drove to work each day. Walt's daughter, Diane, was only three, but that's old enough to enjoy one of the most classic of amusement park rides. Walt struck up a conversation with ride's owner. 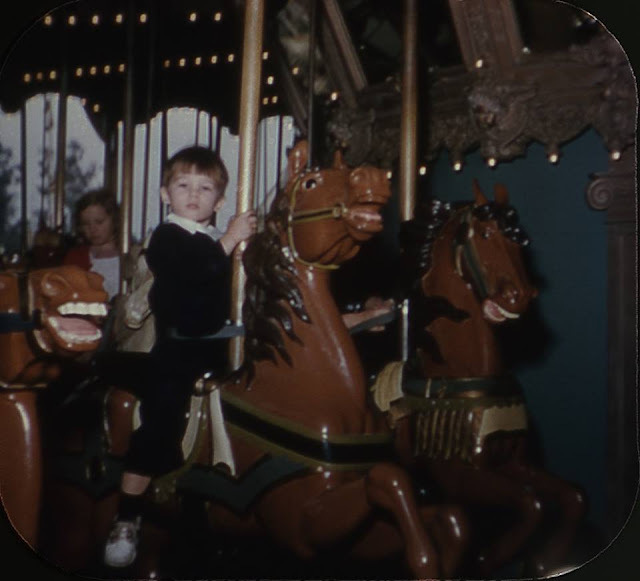 Ross R. Davis owned and operated merry-go-rounds in Los Angeles' Lincoln Park, Tilden Park in Berkeley, and now in Griffith Park. Davis' newest ride had been built by Spillman Engineering for San Diego's Mission Beach Amusement Center (now Belmont Park) in 1926. It had 68 hand-made horses, all jumpers, and a band organ that played more than 1,500 songs. Walt wasn't specific in his 1948 memo describing Mickey Mouse Park, but he had a clear preference for Davis' Griffith Park design over the 1913 Herschell-Spillman ride at Henry Ford's Greenfield Village. That one was a so-called "menagerie" carousel, with chariots, roosters, storks, giraffes, zebras and a sea serpent. Tivoli Gardens, another influence, had a similar ride, the Dyrekarussellen, which included a bench high on an elephant along with other animals. Walt liked Davis' jumping horses. Walt likely pestered Ross Davis in 1954 to either sell his merry-go-round to Disneyland, or to locate another one. Soon, WED was negotiating with a Canadian carnival operator named J. W.—call me "Patty"—Conklin and his partner, Speed Garrett. Patty, former president of the Showman's League of America, operated shows across the US, but was based in Toronto. In fact, the Metro Toronto Gardiner Expressway project required clearing the Lake Ontario waterfront west of downtown, which meant razing the Sunnyside Amusement Park, and Patty Conklin was the agent selling its rides. The carrousel was erected first, then the aluminum roof structure. 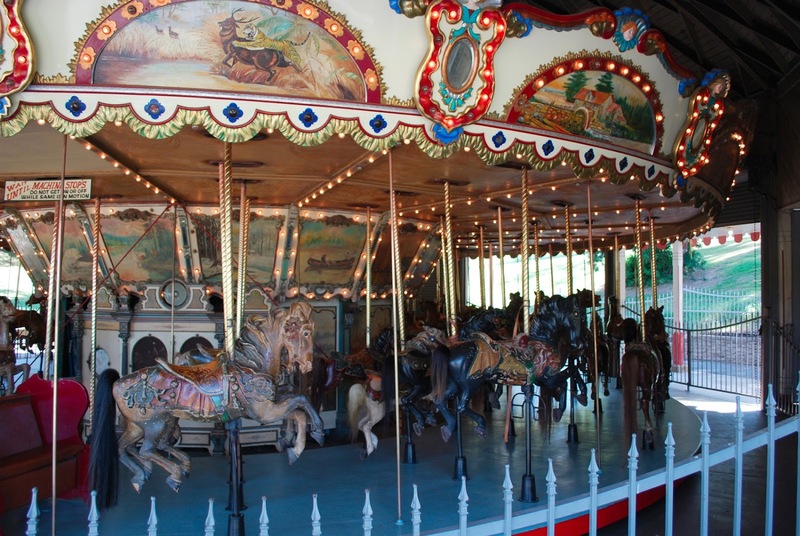 For $22,500 ($210,000 in 2018), Walt bought Sunnyside's 1922 Dentzel carousel. This ride had three rows of animals and only the inner two rows went up and down. In 1954, hand-carved carousels were not venerated as they are today. Old rides wore out and were discarded. So, sourcing horses to replace the menagerie animals carved by Dentzel's shop was not difficult. 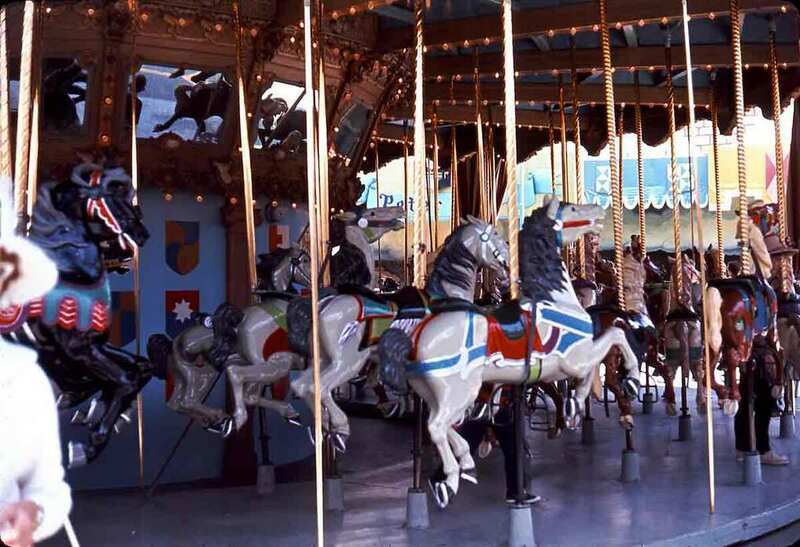 Ward's Kiddieland at Coney Island had some horses lying around, and Disneyland employee George Whitney, Jr. tapped his father's Playland at the Beach in San Francisco for five more. The carousel was purchased in October 1954 and shipped to Arrow Development in Mountain View, California. Arrow signed a $15,000 contract on November 10 for "propulsion with modern power, installations of roller bearings, and the expansion from a three to four-abreast device"—The Billboard, May 14, 1955. Power would be a five horsepower electric motor with a twin disc, 8.5 Hydro-Sheave drive. All seventy-two seats would be horses, and all four rows would be jumpers. The ride turns counter-clockwise so that riders can wave (or grab a brass ring) with their right hand. 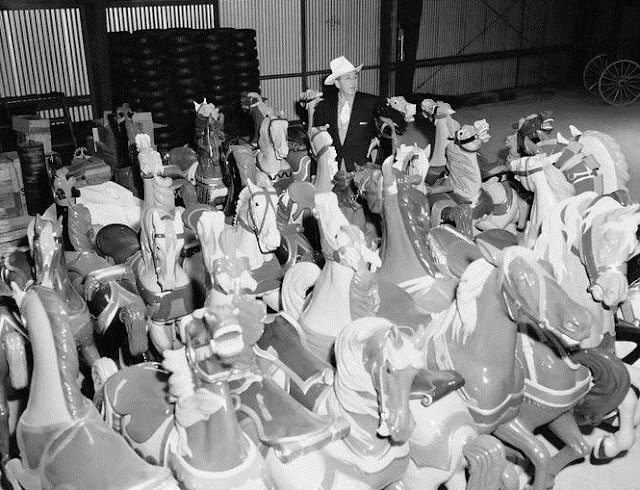 Walt Disney and some of his herd—fewer than half. 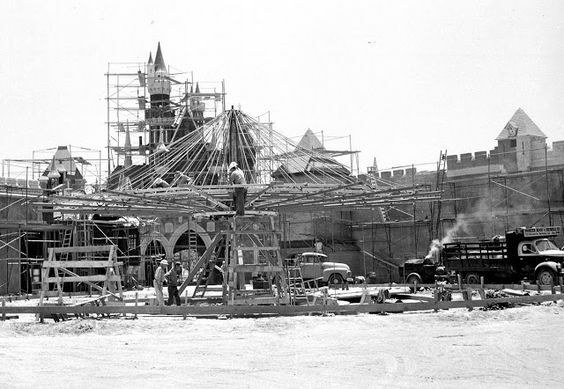 To protect the vintage ride, imagineer Bruce Bushman designed a 64-foot diameter aluminum tournament tent roof, supported by ten posts, crowned with shields representing the founding knights of the Round Table, including Launcelot, Galahad, Perceval, Tristan, Gawain and so on. Disneyland has, more or less consistently, spelled it Carrousel, with two "r"s. That's the French spelling, and they are credited with inventing the ride based on a Turkish training device. But in the mid-1800s, it was the English who first attached a steam engine to the familiar ride which had heretofore been animal- or human-powered. The Brits preferred the term "roundabout" or "merry-go-round." In my opinion, distinctions such as "it's a carousel if it turns clockwise" or other rules have, if they ever made sense, been violated so many times that they are now meaningless. Arrow requested $5,000 more to complete their work. They carefully set aside the unused animals and chariots so that they could be reused on the Casey Jr. Circus Train and elsewhere. The rounding boards, including mirrors and carved jester busts, were painstakingly refurbished. The story is that Walt sat on the bench and watched his young daughters ride on Ross Davis' merry-go-round and thought "There should be a park that would appeal to both children and adults." What was to stop Walt, the bench-potato, from riding with Diane and Sharon? The three rode real horses together, after all. 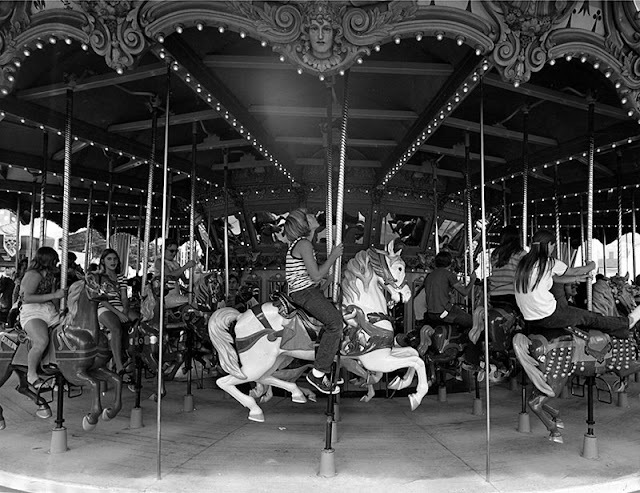 Walt insisted that the carrousel in Disneyland have all hard-to-mount horses—no benches or chariots—without once thinking "There should be a ride that would accommodate both children and adults." The ride is about 2.3 minutes, with 3.2 minutes for unload/load, so the theoretical hourly capacity is about 785. That's pretty good, but it's nothing compared to the Haunted Mansion's 2,600 or Pirates of the Caribbean's over 3,000. The horses were white, black, tan and brown during Walt's lifetime, but the herd was changed to all white horses in 1975. 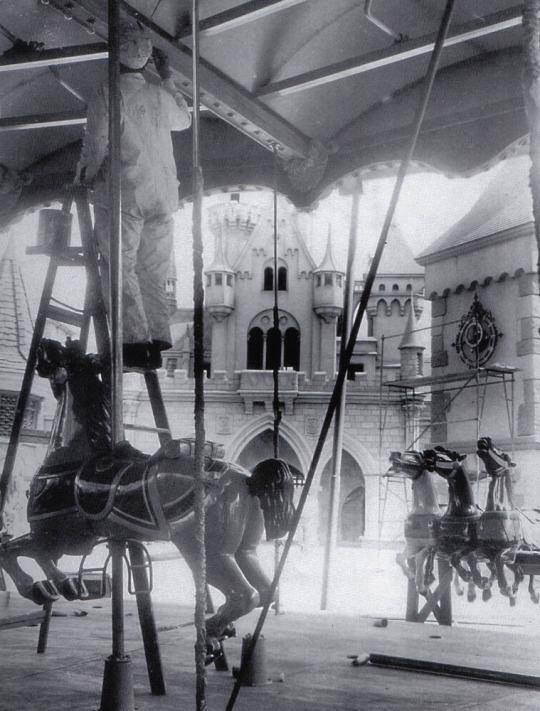 For more on the Arrow Development refurbishment, see Dexter Francis' "King Arthur's Carrousel." Viewmaster photo showing the original horse colors and styles.